In honor of Jonathan London's newest Froggy book, which was released March 10, 2015, we're sharing 6 froggy birthday party ideas for book lovers. Feel free to share your own frog theme birthday ideas too. Enjoy! Froggy's Birthday Wish by Jonathan London. Froggy is celebrating a birthday. He gets lots of wonderful, exciting presents, but he isn't happy. He wants something else. Finally, Froggy's mother shows him her present. Now Froggy is happy! This book is fun to read in a classroom setting for a birthday celebration. 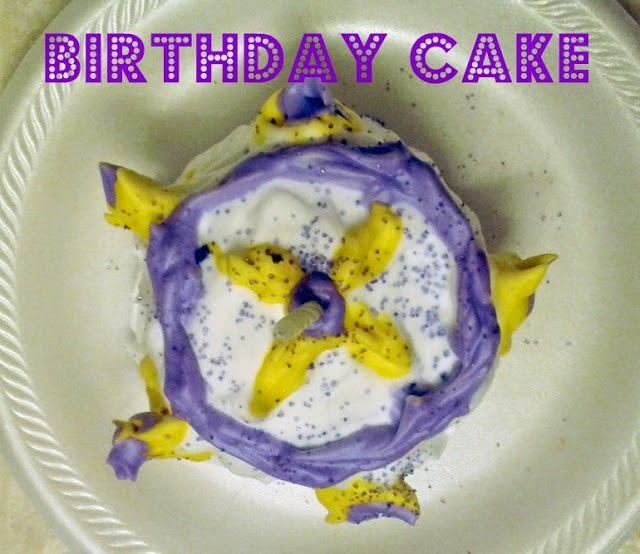 You might like this fun birthday cake craft to go along with the story. Another fun birthday activity is to make your own Pinata from construction paper and a cardboard tube. Froggy had a moon pinata, but we're making a traditional donkey pinata. This mini pinata is perfect as a party favor or place setting decoration. Just fill with your favorite candy or treats. How to make a donkey pinata party favor. You will need: construction paper, scissors, paste, 2 cardboard toilet roll tubes or 1 cardboard paper towel tube, and tape. Cut 1/2" strips of your favorite colors of construction paper. Use tape to attach to the base of the tube (torso) as seen in figure 1. Wrap until the cardboard tube is covered and tape to attach the end. Next, cut 1/4 of the other cardboard tube. This will be the head (see figure 2). Cut four 1/2" slits, 1/4" apart on one end of the head. This will allow you to connect the head to the end of the other tube. Leave the two center slits to attach the ears. With the leftover piece of the cardboard tube, cut two ears as shown in figure 3. Slide the ears into the center slits and then slide the outer slits onto the end of the other tube as shown in figure 4. Next, wrap the head and ears just like the torso portion. 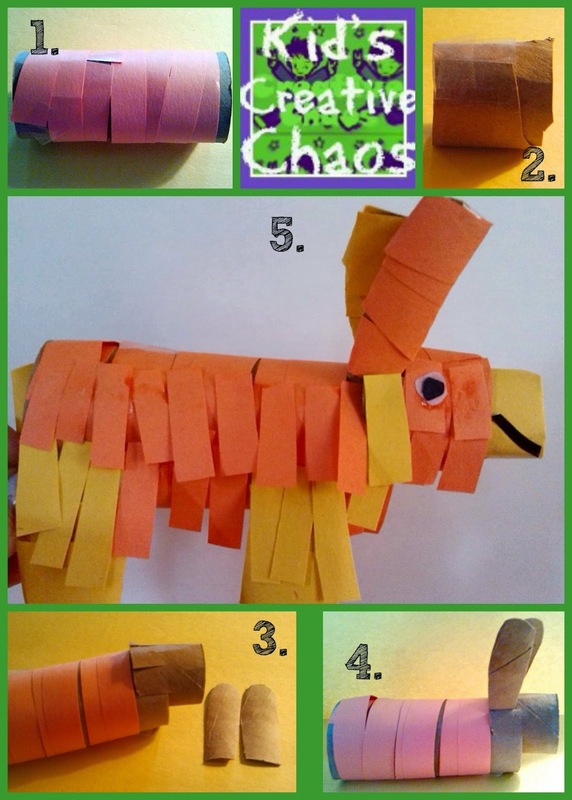 Now, cut small strips and glue to cover the donkey until it looks like a real pinata as seen in figure 5. Cut two 2" wide strips of paper. Wrap one into a link, tape the ends, and stick into the head. This will be the nose. When complete, use construction paper to make a mouth. Use the other one on the other end- this will keep the candy in place. Finally, cut eyes out of construction paper and attach. Congrats! You've made a mini pinata party favor. Breathe a sigh of relief... yep, it was harder than we thought it would be too, but if you are relaxing watching television you can knock several out in an hour. Practice makes perfect! Froggy's Worst Play Date by Jonathan London. Froggy wants to go out to play, but all of his friends are busy. Good news! Mom has set up a playdate with Frogelina. He has to watch the Frog Prince. At the movie, they eat popcorn and have a food fight! In the end, Frogelina steals a kiss from her froggy prince! Have you ever tried this movie popcorn trick? 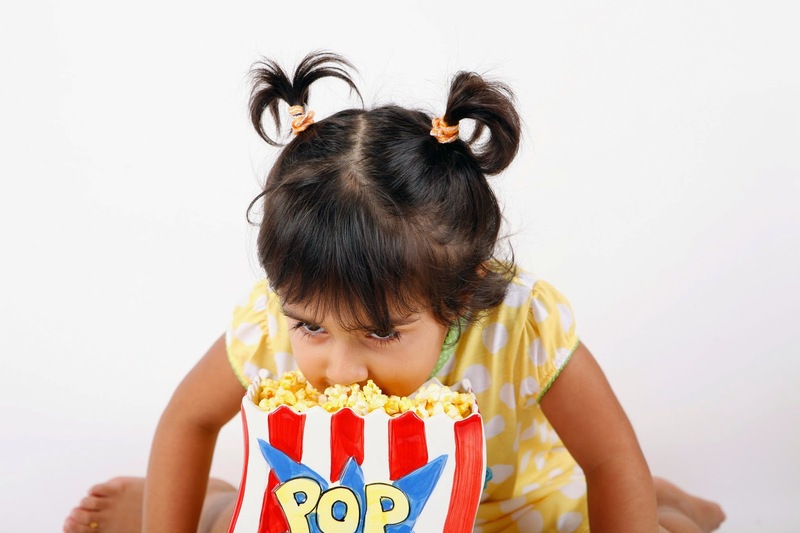 Do you know the trick to eating popcorn? This little girl doesn't know the trick! At your next birthday party, amaze your friends with magic. Did you know movie popcorn will jump on your tongue? Yep, all you have to do is stick your tongue out over a bowl of popcorn and Voila! The popcorn attaches to your tongue! Try this with our homemade microwave popcorn. This is an fun alternative to Brown Sugar Pop Tarts. Pour butter into paper popcorn bag and shake to mix. Add brown sugar and cinnamon, and shake bag again. Enjoy. What else can you do with popcorn? Things to do with popcorn. To celebrate the book, make a Frog Prince Puppet . 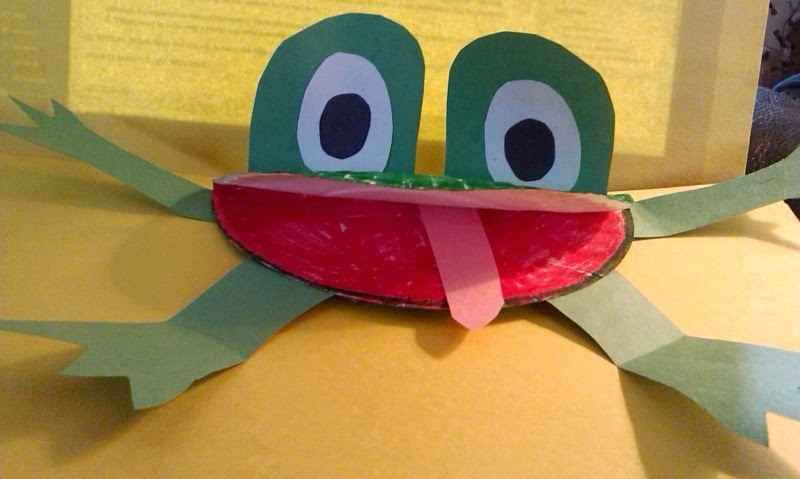 Here's a similar frog puppet pattern and how to from DLTK. We used a mini paper plate and styled our puppet to look like Froggy! If you want, add a yellow crown to make a frog prince. Frog puppet for Froggy's Worse Playdate theme birthday party. You will need: mini paper plates, paint or markers, scissors, tape, and construction paper. Froggy's parents are celebrating their 10th anniversary. Froggy has to stay home with his baby sister and a baby sitter. Froggy makes lots of messes, and he plays in the bathtub with his baby sister. Froggy's Best Babysitter by Jonathan London. As a companion craft for this book, and a fun activity for your frog theme birthday party, you might like to make a froggy pond sensory play bin like this one from Growing a Jeweled Rose. is a fun birthday party activity for toddlers. Have you enjoyed these books and companion birthday activities for book lovers? Are you ready to plan your own frog themed birthday party?